This morning, Dr Dave Allen Hon Curator of Hampshire Cricket and a Principal Lecturer in the visual and creative arts at the University of Portsmouth, returns to the crease to continue his critical examination, begun yesterday, of the arguments for reform of the English County Cricket Championship comparing the county cricketer’s life now with that of fifty years ago. 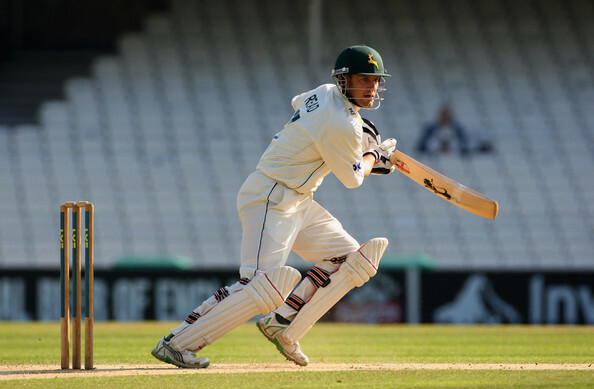 All eyes on Chris Read ? Almost any contemporary discussion about the county championship centres on the wishes of most players and administrators to reduce its quantity in the interests of providing more time for rest, recovery and the refinement of skills. These are understandable desires but not something that most spectators wish to pay for – they want to watch cricket. The other question is how dependable are the arguments of cricketers. My favourite example came from an interview with Michael Vaughan published in the Sunday Times on the eve of the West Indies tour in 2003/4 when he told Simon Wilde that while England captains over the past twenty years had sought changes, “nothing seems to happen”. In fact the changes included three to four-day cricket, fewer Championship games (from 24 to 16), central contracts, two divisions, reduction in the length of limited overs matches, the imminent launch of T20 and the introduction of day/night matches. Otherwise, just as between 1909 and 1959, everything remained the same! The comment was absurd, but it suggests that whatever changes are made, cricketers will continue to bemoan their lot. The key question is whether there really is too much cricket and just what the right amount might be. In 1960, Hampshire’s cricketers played over a shorter period (from the start of May to the end of August) but they were required to play around 5.8 days each week and they were not on twelve month contracts enabling them to practice through the winter. In 2010 they will have a more varied and longer season but an average of just 3.8 days play per week. After decades of competing in the Championship plus three limited-overs contests, they now have just two – and nothing over 40 overs per side where once there might be 60 – even 65 overs. Yet still they want to play less cricket – and crucially less Championship cricket. The details from the 2009 season emphasise the point. The busiest Hampshire cricketer was Michael Lumb who played for 93 days in the 23.5 weeks of the season – an average just short of four days per week. He was followed closely by Adams, Ervine, and Dawson but no one else got to 3.5 days. Only Cork (3.1) and Carberry (3.02) of the others averaged above three days and only Tahir (2.97) and Pothas (2.76) above two-and-a-half days. Those figures include any days abandoned to rain and show that even Lumb had more than 10 weeks in the season ‘free’ from first team cricket. Incidentally Lumb’s rewards for his endeavours were lucrative selections for the IPL and England T20 side. Players will argue too that the demands of travel eat into the periods of rest and practice which of course they do but again, they travel less often than the players of 50 years ago who generally finished matches on Tuesday and Friday evenings, took to the road and started again the next morning. Now they travel by coach or plane, then they drove or took trains. In addition, squads are larger today. In 1959, 15 men appeared fairly regularly for Hampshire and six of them in more than 30 matches. Four others appeared in three or fewer. In 2009, with half the number of first-class matches, 16 men played fairly regularly in the first-class games. Six others played in three or fewer first-class games but four of those played quite frequently in limited-overs competitions. In all, 22 players appeared in competitive cricket for Hampshire throughout the season. The only bowler who exceeded 12 of the 16 Championship matches (75%) and bowled more than 100 overs was the all-rounder Sean Ervine, who averaged around 15 overs per match. Games finished more quickly fifty years ago, not simply because there were more results and not always because of uncovered wickets, but more relevant is that scoring rates were slower and pitches more variable – partly through the use of so many outgrounds. Whether centralisation, uniformity and inspection have ‘improved’ pitches is a moot point. Despite uncovered and varied pitches, we have seen that in 1959, Hampshire’s batsmen set a record for the number of runs scored in a season with 32 Championship and other first-class matches. In 2009 they played half as many first-class matches each with one extra day and on covered wickets. Yet their total of runs in 16 Championship matches was 7,318 – only just over half what they scored in 1959 (14,378). In addition, while the quantity of runs scored remained consistent over fifty years, fewer wickets fell. In 1959, Hampshire’s bowlers took 473 wickets (excluding run outs) in 32 matches. In 2009, with an extra day they took exactly 200 in half the number of matches. The average difference in wickets per match was 14.8 to 12.5 and so the balance has shifted, if not clearly to the batsmen at least away from wicket taking. As a consequence more games are drawn. Another argument is that three-day cricket encouraged too many contrived finishes. I am making no case here to return to the shorter form but there are many myths about the number of such games and the amount of mediocre cricket they produced. 1987 was the last year of all three-day cricket and it was a poor summer. Nonetheless only two results were obtained in a 24 match season after the intervention of ‘non bowlers’ and for Hampshire they were only Parks and Robin Smith, who bowled just 20 overs between them in the season. One of the worst examples was in the jockeying for first division places at the end of the 1999 season when Hampshire and Derbyshire set up what became an enthralling finish on the final evening. But they did so controversially not because of rain but in anticipation of it, and not on the final day but on the penultimate one. That, of course, was a four-day game. These days, in the first division at least, teams won’t set up games for the entirely negative reason that they fear relegation. We can argue endlessly about comparative quality and come to no conclusion but it is easier to make key points about why people wish to watch certain forms of the game. It’s pretty obvious that T20 is now the most popular form of professional cricket but how many would watch it on a Tuesday morning? The current Championship – especially in the first division – produces too may dull draws and too much of it is played at times of the week or the season when it does not attract spectators. Nonetheless, through their financial commitment in the dark winter days, members are paying for a seat even when they may be required to be at work on a Monday afternoon or Friday morning. Nobody knows how many members will be lost if the number of days of Championship cricket is reduced again because nobody asks. Nonetheless David Collier said about the likely reduction: “Membership brought in by the championship is a big thing but, if the standard goes up because players are better prepared, that is a good trade-off.” He did not specify precisely what would be lost in that trading but I suspect he means my support and the support (and regular, reliable financial investment) of people like me. If so, it’s been a lot of fun and I’ll miss it – but I won’t go quietly. Two really enjoyable surveys of where county cricket stands now. For a long time it’s been my contention that the authorities are happy with the fact that first-class cricket is largely played on days and at times when hardly anybody apart from students, the unemployed and the retired can watch it, and there’s little or no little prospect of that changing. As someone who works full-time and who doesn’t want to use all my leave watching cricket each season, I find that I can see less and less. But then, as the sides weaken and the ‘product’ declines, I find that I want to watch less and less. My Somerset subscription has survived into this season, but for how much longer?